In the bestselling tradition of Why Nations Fail and The Revenge of Geography, an award-winning journalist uses ten maps of crucial regions to explain the geo-political strategies of the world powers. 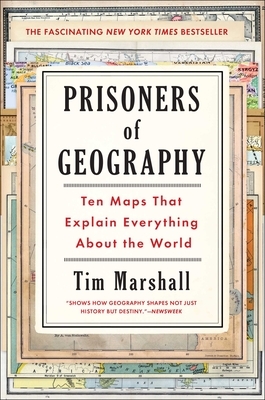 In ten, up-to-date maps of each region, Marshall explains in clear and engaging prose the complex geo-political strategies of these key parts of the globe. What does it mean that Russia must have a navy, but also has frozen ports six months a year? How does this affect Putin’s treatment of the Ukraine? How is China’s future constrained by its geography? Why will Europe never be united? Why will America never be invaded? Shining a light on the unavoidable physical realities that shape all of our aspirations and endeavors, Prisoners of Geography is the critical guide to one of the major (and most often overlooked) determining factors in world history. "[Q]uite simply, one of the best books about geopolitics you could imagine: reading it is like having a light shone on your understanding." "Marshall is excellent on some of the highways and byways of geo-politics." "Fans of geography, history and politics (and maps) will be enthralled." "This is not a book about environmental determinism – the geography of a region is never presented as fatalistic; but it does send a timely reminder that despite technological advances, geography is always there, often forcing the hand of world leaders." "Lively and perceptive political and historical analyses are frequent. The chapter on China is excellent; the chapter on Africa combines geography and history in a convincing way; the chapter on Western Europe...is a brilliant narrative of European relations,particularly between France and Germany. The superb chapter on the Middle East makes for a clear indictment of the Sykes–Picot agreements and of their tracing of artificial borders. The chapter on the Arctic is precise and informative ...A very lively, sensible and informative series of country reports in which geography occupies its rightful place along with shrewd historical reminders and political judgments." "This book is especially timely...Landscapes, rugged or otherwise, and what the land holds in resources, exert their own kind of sway that no one, not even a Putin, can surmount. This book grabbed me because of its enormous relevance to our world today."